Solfasirc is a creative platform, which experiments with dramatic language and wants to share the fruits of its experimentation with its audience. The only way to share this is from the stage. Formed as a working group at the end of 2005, its current members are Biel, managing the circus, Delfi and Mari on the piano, Marc on the guitar, Enrico handling the audiovisuals, Aleix doing the lighting, Jordi and Willy managing the technical part, Mar working on the design, Rosa creating the images and Ferran, our the stage advisor. The virtue of music and of the interpreter or composer is to transmit the world in which we live to society. It's essentially the same for all the arts, but music, like silence, is universal. That's why I love to work with people with different artistic horizons, for whom music, without even noticing, has a lot to tell. This guitarist, who holds a BA in Jazz Music from the Escola Superior de Música de Catalunya, doesn't want to limit his creativity to a single music style. So, we can see him playing in jazz, rock and funk bands....or even in circus shows like ours. She's got a diploma in piano from the Conservatori del Liceu de Barcelona. Lively and inquisitive, music lets her fly from Jazz to Flamenco to Baroque. Season these ingredients with the Art of circus, a dash of humour and amazing people, and just lie back and enjoy. Born in the Colonia Güell, he first worked on image recording and edition at different TV channels, as well as in the world of publicity. During that period he also worked as a graphic designer and press photographer. In addition, he worked in several audiovisual projects (videoclips, short films, self-created video projections and with the audiovisual company Nomadreams). After being intensely involved in theatre and circus productions, he decided to study at the TTE to be trained as a light and sound technician. Ever since then he has mainly worked in theatres but also in live music shows and television. I have been a light technician since 2006, with higher studies in Image at the ITES Imagen y Sonido centre. I started off in the world of television and publicity, and two years later I got caught up in the world of theater. 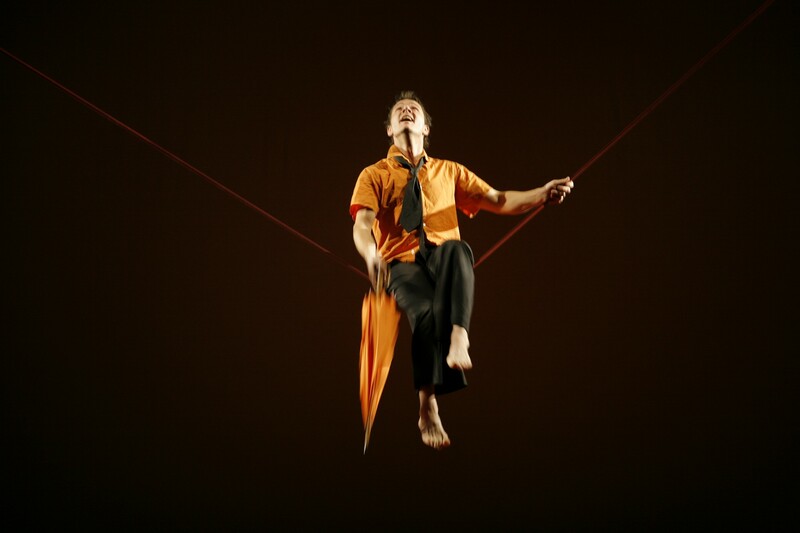 I have been working in theatres from Barcelona (Mercat de les Flors, Ovidi Montllor theatre at the Institut del Teatre, the Romea, Apolo, Tantarantana...) and in different theatre, dance and circus companies (Camut Band, Taparpegics, Trakatap, La Nouvelle Epoque, Solfasirc...). Now I work both as a technician at the Tantarantana in Barcelona and with Solfasirc around Europe. I feel lucky to work doing what I like the most and with such a good company. La culture pour vivre, vivre pour la culture!! Elle est notre maman qui nous accompagne dans les tournées!! I have been an actor and a stage director for more than 10 years. My dream is to direct Hamlet, but in the meantime I do other things. I have directed clown and circus shows, monologues, productions at the Teatre Nacional de Catalunya or at the Perla 29, and I give myself to every project and experience it as an intense adventure. I have been working with Biel for years; it was he who opened up the doors of circus to me, and walking with him through this adventure from the stage direction has been fantastic. Can it be true that life is what happens while you are busy making other plans? I like it!